Mirror photo by Greg Bock / A state police trooper prepares to make contact with a man in a standoff in Tyrone on Wednesday afternoon. 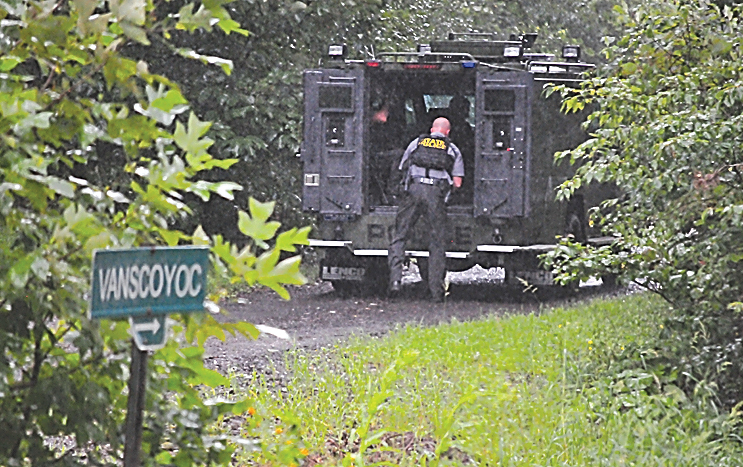 TYRONE — State police spent most of Wednesday outside a Snyder Township home in what troopers say was a psychiatric situation. A man at a home on Vanscoyoc Road, across from Camp Anderson, had refused to give himself up to state troopers who had attempted to take him into custody on an involuntary commitment warrant, state police at Hollidaysburg said. The situation unfolded midmorning Wednesday and lasted throughout the afternoon as numerous state police, along with an armored vehicle, positioned themselves near the home and attempted to make contact with the man, whose name was not released. A neighbor said Wednesday night that the situation ended with the man being taken into custody in the late afternoon. State police Trooper David McGarvey said the man was taken into custody about 4 p.m. on the mental health warrant. He was not in the house at the time.